So There’s a Zendesk Deprecation to Deal With. A Zendesk deprecation can be intimidating. You’ve been using Zendesk in a certain manner for a long time, and then, Zendesk announces that they are phasing out certain features and functionality, such as the deprecation of widgets, the web portal, the classic interface and web portal customizations. Rather than be intimidated, think of this as an excellent opportunity to upgrade your interface and improve how efficiently you are using Zendesk. You can’t expect Zendesk to keep outdated features and functionality forever. As they say, their service must evolve, for security, privacy, and regulatory requirements – and making sure the service remains easy-to-use. While their customer service is, as you would expect, fantastic, managing individual cases and implementations can be a challenge. 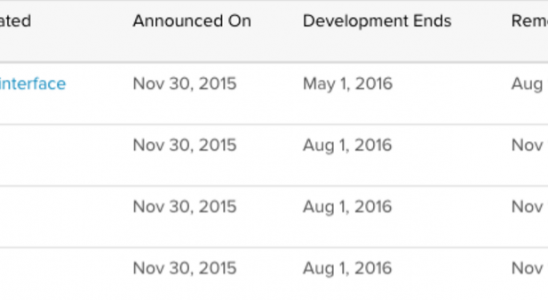 Last June, Zendesk announced several features will be deprecated. While it may sound frightening, all it means is that certain features will no longer receive enhancements or improvements. It will start happening soon though, so you should start addressing the features and functionality being phased out immediately. Different deprecations may be felt more seriously by you. One of the bigger ones announced, is that the old Zendesk classic agent interface (which many people are still using) will disappear in Nov 2016. Everyone who is still using it will be forced to switch to the new interface. You will need to train your agents how to use Lotus. You will lose any custom widgets that manipulated the agent interface. You will lose custom widgets that manipulated the web portal (CSS, JS & HTML widgets). In order to make the switch as smooth as possible there, here are some highlights of things to keep in mind. There is a Zendesk tool for the migration of the web portal base (categories, forums, articles) to Help Center (categories, sections, topics) but it can get complicated and messy. Unfortunately, simply copying the soon to be deprecated widget code from your old web portal to the Help Center is not an option. You can’t take a 1986 Honda Civic and put a 2015 body over it and expect it to run like a 2015. You have to upgrade and replace many of the parts as well. The html code, class names, ids and the general structure, is entirely different in the help center than it was on the web portal. This means that the widget code using class names and html identifiers to manipulate the interface will not keep working after switching to Help Center. In other words: All your customizations, features and branding will be lost. You’ll need to redo the design and development of custom features. You can recreate the front-end for old web portal using HTML/CSS/JS in the new HelpCenter. (Or maybe you didn’t have a Help Center you were proud of to start with – and this is a good opportunity to change that!). You’ll be able to find comparable apps for each widget in the Zendesk store. However, if it was a custom widget, you’ll probably need to have a custom app made for you. There’s a chance the classic widget can be replaced by an existing app. There are also 200+ apps that work with Zendesk and growing. “There’s an app for that”, an app to fulfill your customer needs and save you a lot of time. It can be a daunting task to determine not only how to integrate them, but even finding the needle in the haystack. If you have old agent interface widgets make sure they are adapted to the new Zendesk Apps to maintain your custom functionality. Make sure your old Web portal widgets are shifted to new Help Center customizations. If you are looking for inspiration check out this post on rules for building great help centers and these 10 great examples of help centers that we built. Above all, make sure your data is migrated properly. There’s nothing worse than a customer not being able to find support for their problem. If done properly, the Zendesk deprecation of features and functionality will actually make your Help Center a better overall experience. This is a great chance to implement best practices on ticket deflection and update your whole help center system. Zendesk’s deprecation really is about innovation and improving your user experience take advantage! If you are looking for any support Zendesk related, talk to us. As an official partner, we’ve worked on hundreds of Zendesk projects and migrations – and we guarantee to make your life easier. You can check out our full range of services here.